In July this year I saw a small ad on the net which I found very strange. 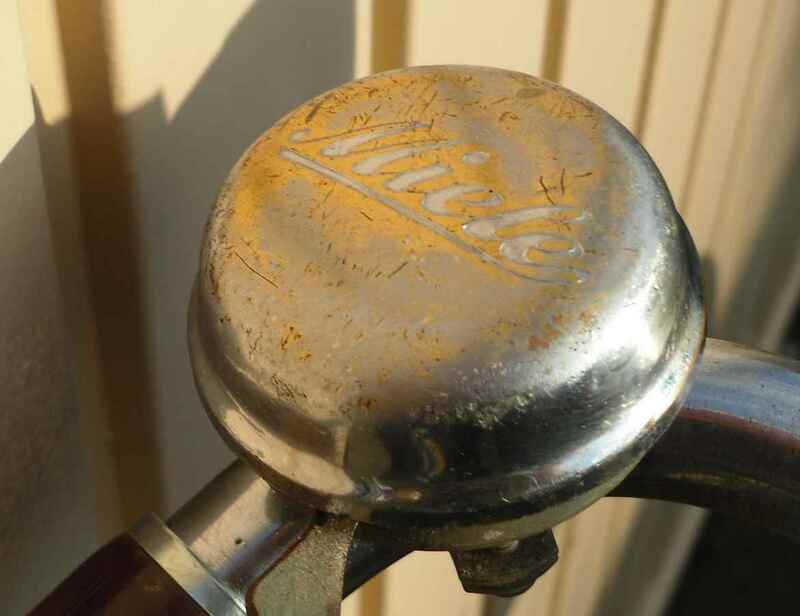 A ladies bike was offered for sale which I at first thought could not be what it was advertised as: A very old Miele. 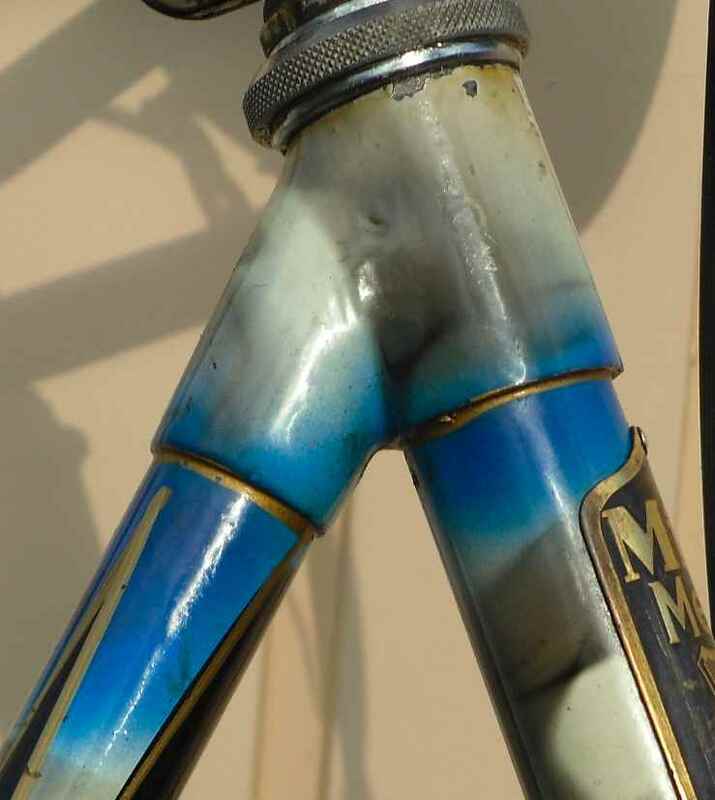 The typical details which give away a bike of this brand were not in the photos, and the bottom bracket was advertised as being damaged, but the selling price was attractive, so I wrote off to see what it really was. 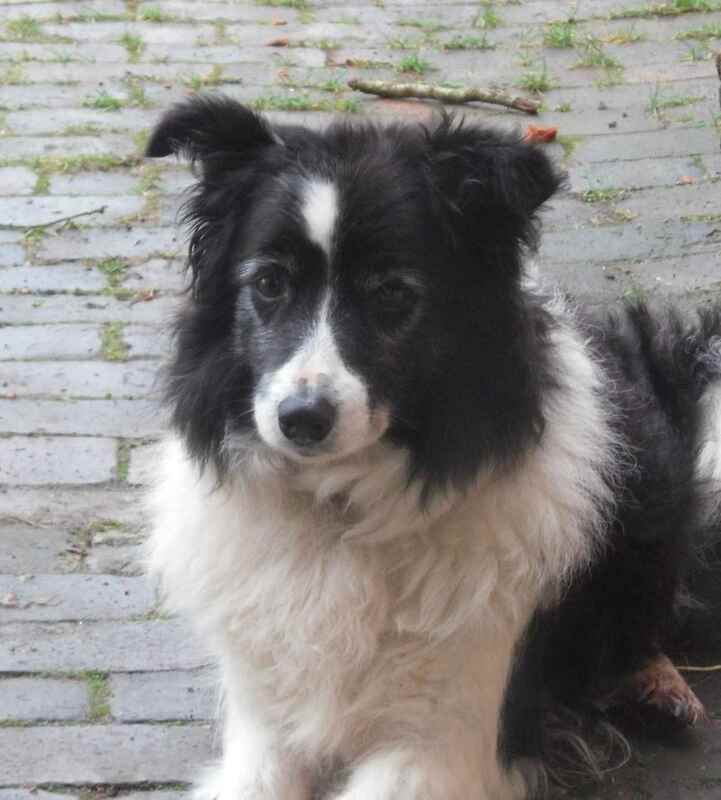 It then seemed that the seller was right and so my son and I paid him a visit; we were on the return trip from a friend´s place, and the seller and his family were literally leaving for their summer holidays that moment. 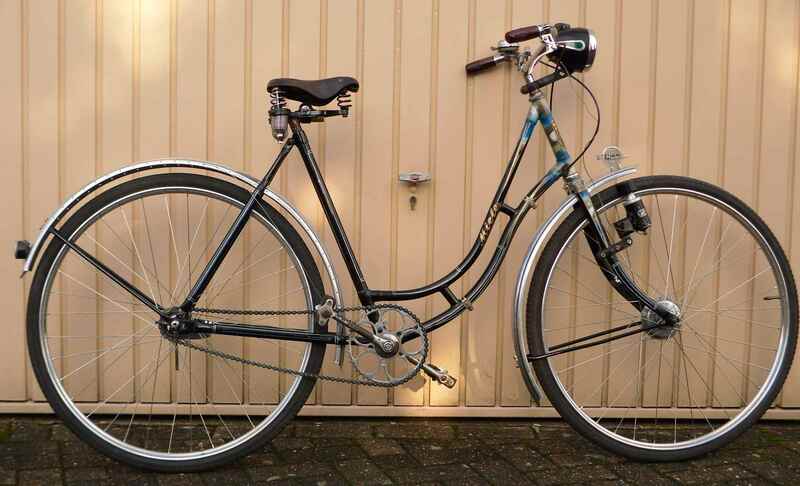 As I wanted the bike, seeing that it had potential as the very rare ladies sports frame it is, but also aware of the fact that there would be a lot of work, it took only a few minutes to strike a deal with the seller accepting my conservative offer, and off we went. This of course is an “after” shot, inserted here as a means against optical boredom. At home the full extent of the catastrophe became clear: Yes, the frame had been made around 1934, which was good, and it was straight, but it had also had undergone what people call euphemistically an “older restauration” – in other words, someone had tried their luck, probably back in the seventies, to make the best of what was available then: Wrong mudguards (with the Miele mascot missing, of course), wrong wheels, a paintwork which was nice but could have been very nice given a little bit more effort, a lost headbadge, a damaged and incomplete bottom bracket assembly, headset bearing likewise, and so on. I didn´t take any photos because I didn´t think this bike was savable after all. But then luck began to strike, and hard. Five people placed small ads on the self same website where I had found the bike, within weeks: One for a great bell, the next for a wonderful lighting set, one for exactly the right saddle, one for a bike with a damaged frame, but good spares, and another one for another bike I could take some bits off of and squirrel away the frame for future use. All sellers, save the one offering the bell, advertised really affordable prices, too, but as bells have a big fan community it is usually possible to recover the money if one pays a “fair” price, like in this case. Not that I would want to get rid of it in a hurry, but still. I had the people send the saddle, the bell and the lighting set, and went to get the two damaged bikes. 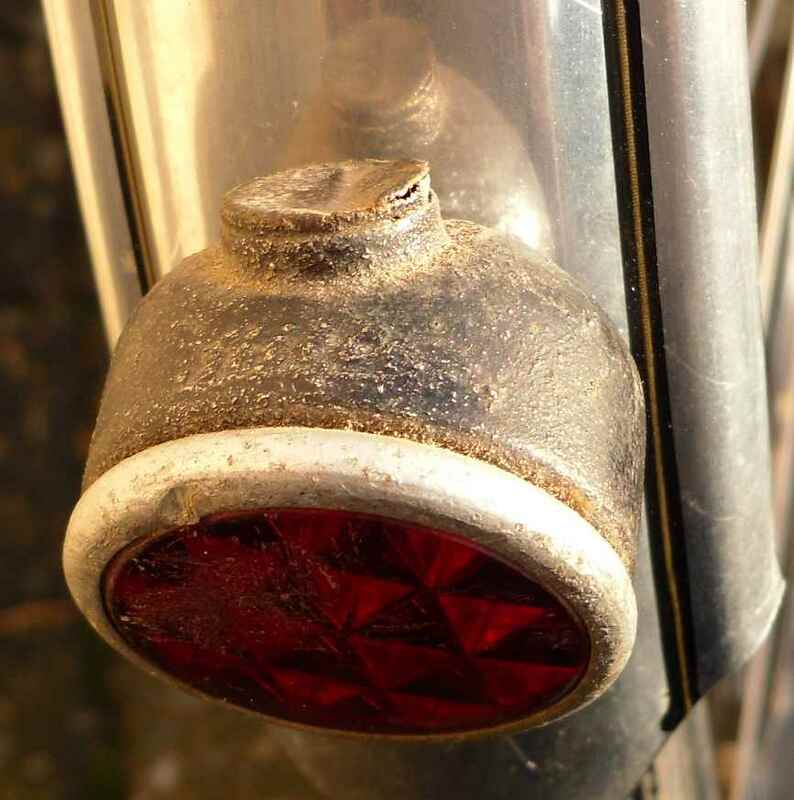 The 1932 ladies from a place near Düsseldorf was picked up when I went to the area anyway, and it turned out to be ideal: Frame beyond repair, but a donor for the headbadge, the missing headset and b/b bits, and the handlebars. The hubs were quite rare, too. I have to remember to sell them on. 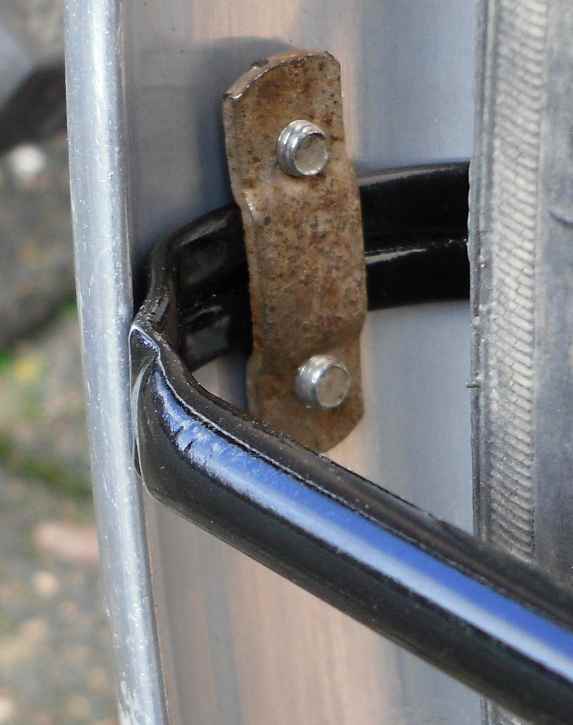 making it a sports frame, those parts would reflect the less heavy duty purpose the bike would originally have had. 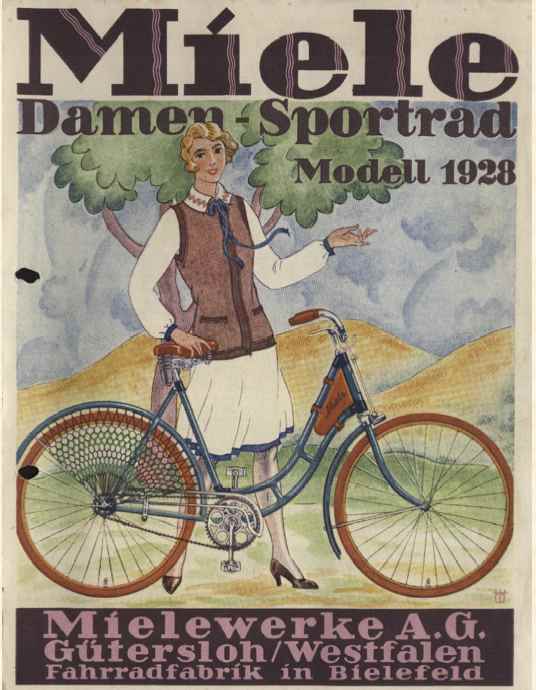 There are ladies sports bikes in the early Miele catalogues, too, so that was what I tried to imitate, with the added bonus of a Sturmey FB hub. 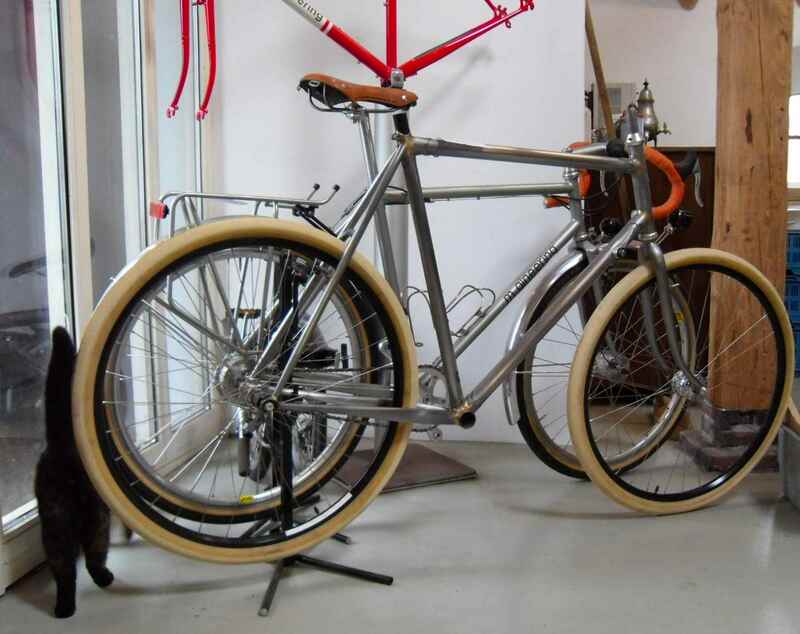 I think that´s not only what I would have chosen had I built the bike up in the thirties, but it was done in the day, too. Not in the advertisement above, but there are instances of it. In the pic above there is another interesting detai: The most marked difference between sports and utility bikes seemed to be the absence of the steering damper in sports bikes. No damper in the pic, none on my bike. It helps greatly that this hub also dates from the thirties – 1938, in fact. The Doppeltorpedo sale took some convincing and a good swap offer, though, as these are getting rare now. OK, 1939 is a few years out, but it´s not too bad. The model had been around in 1934. 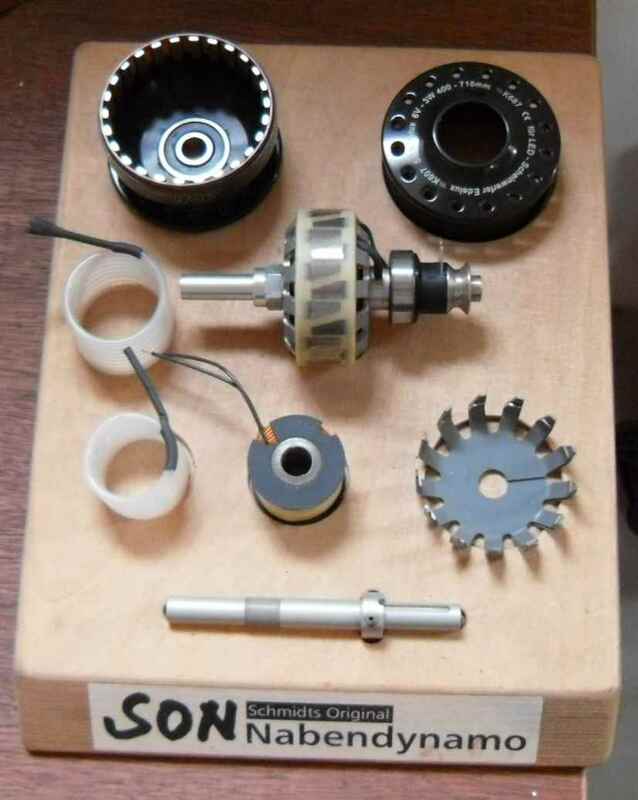 In general these little two speed hubs have a good reputation, and once you have gotten hold of a specimen c/w the periphery, some spares should also be avialable if the need arises. 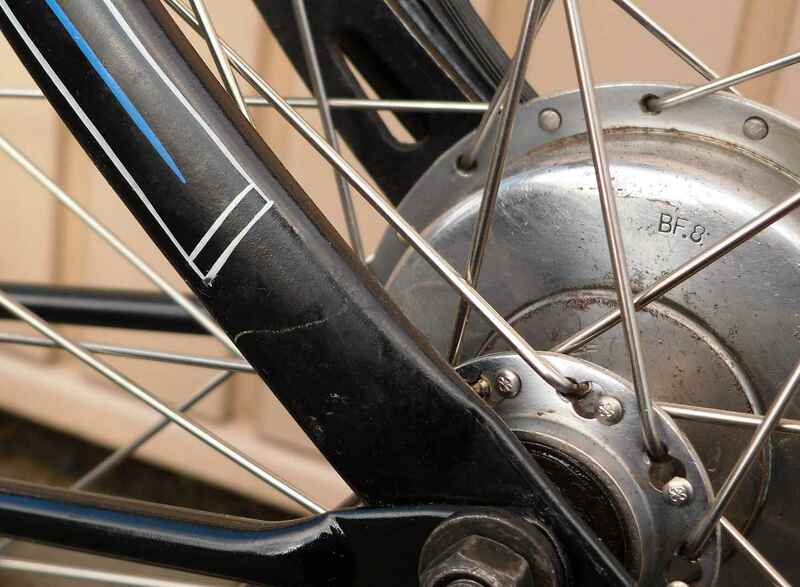 They incorporate a rather effective coaster brake, so they do away with the need for finding a rear brake, which is an added advantage. 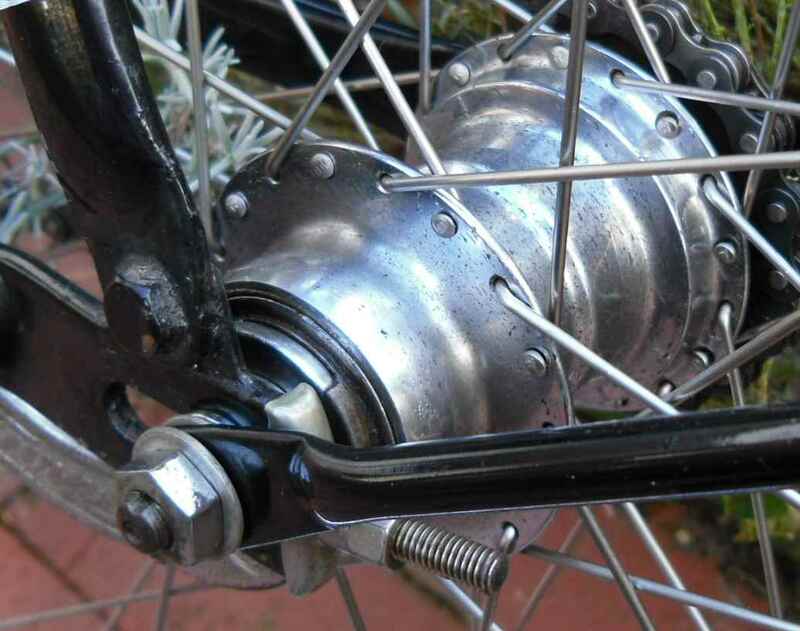 The hubs were laced in 28 x 1 1/2 (635) rims of a Westwood cross section. 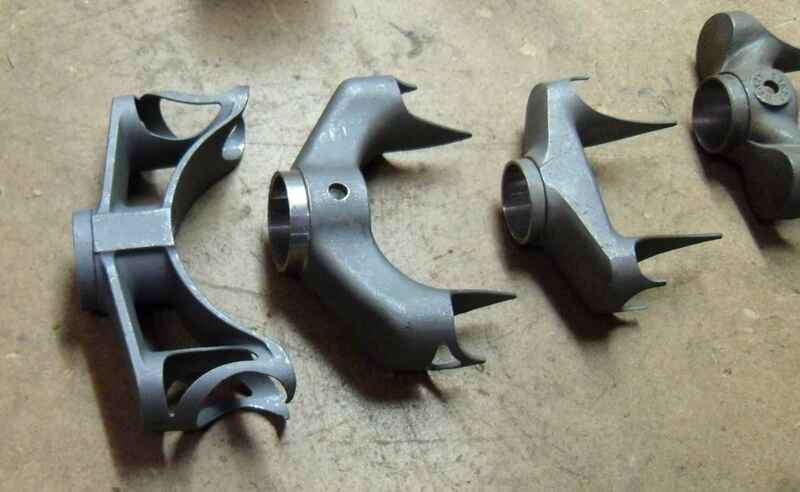 These are still available from the bike shop, for use on some Dutch roadsters, and look just the ticket. The frame takes them, easily, and as such it also is a bit sportier than usual. In 1934 there would have been balloon tired bikes, and in sports versions, too, but again: The 635 version is what I would have chosen, so I went ahead with that. It then took a while to find the time to assemble the bike, and while wrenching earlier today I noted the sun had come out. There was the choice of finishing the bike (shift wire, rear mudguard protective netting) and taking the photos in the rain, or shooting the unfinished bike in better weather – you have the results in front of you. The cockpit with the Doppeltorpedo actuating lever next to the regulation bell. 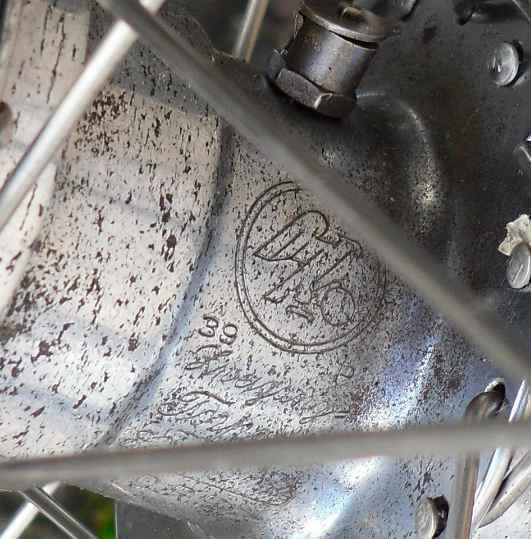 The Weltkugel (“globe”) mascot was taken off the 1938 gent´s bike I bought to have the frame for another project. while post-WWII mascots have threaded bolts protruding from them. Also the feet and the letters of the older versions are more clearly defined, and the whole cast gives a much cleaner impression. The cut of the letters is slightly different, too. This reflector also came off the 1938 gents. 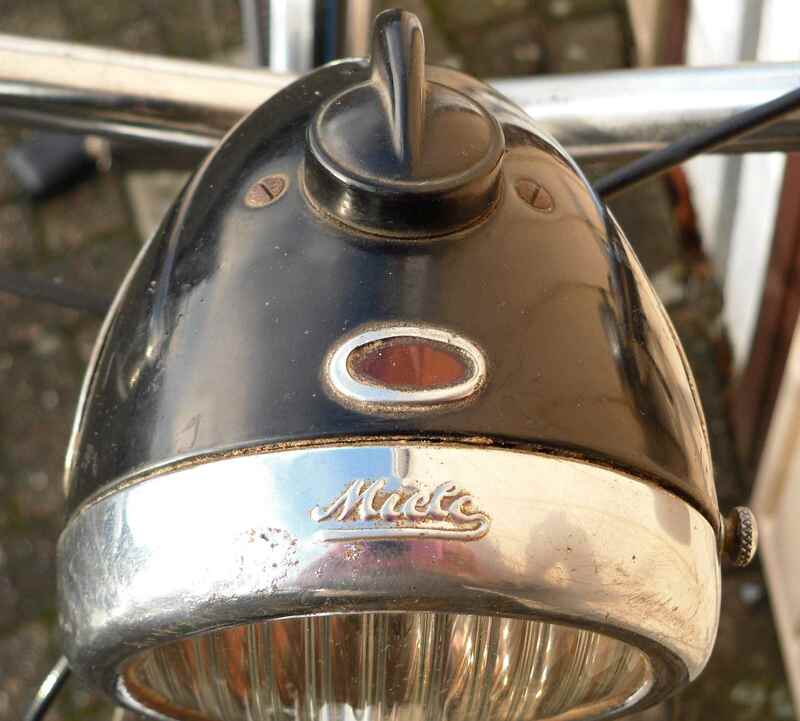 If you look closely, you can see the Miele script between the alloy rim and the covered hole. I know it´s worn and ugly, and it´s also the cheap version on an expensive bike, but I´ll have to wait for the real thing. There were two versions of this, one a complete lamp with an insert where the covered hole is (RM 1.50), and the reflector with the hole shut. 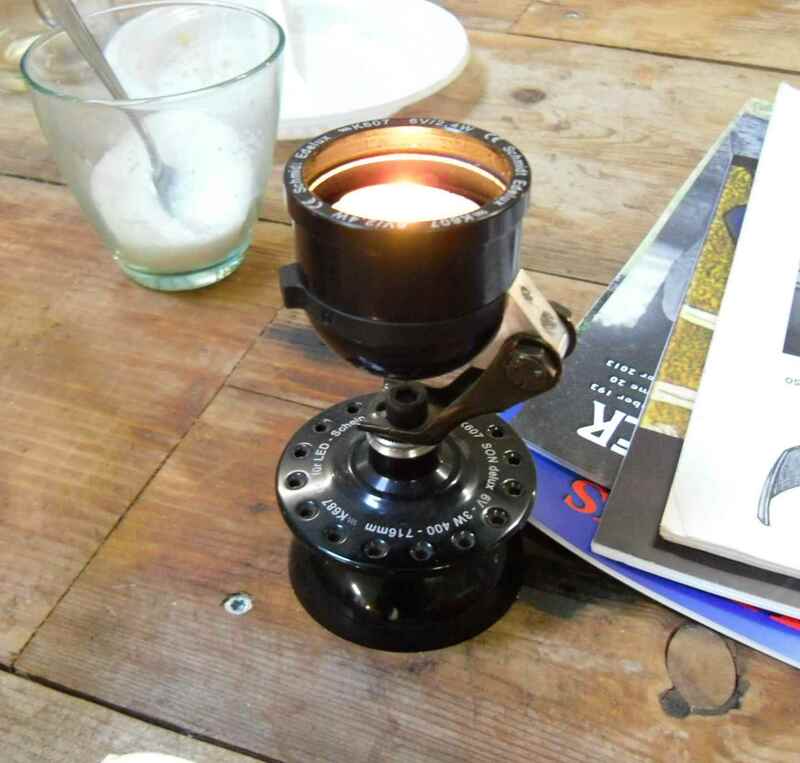 There is no price in the catalogues for this, but one for a set to convert it to a rear lamp: RM 0.90. 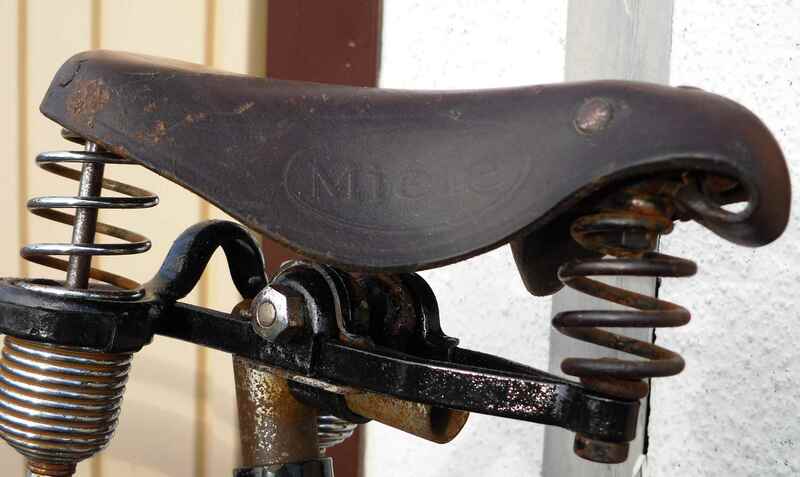 This is the saddle which came from Eastern Germany. It´s in a remarkable condition and only took some cleaning and repainting of the black parts. 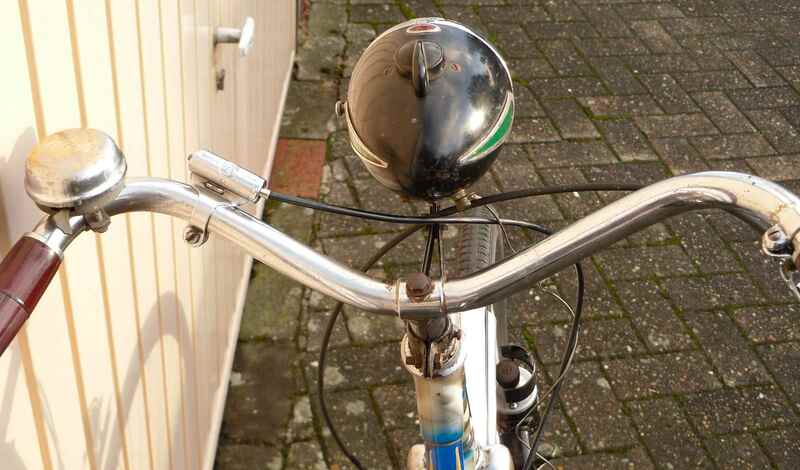 Also note the original angled seat pin. 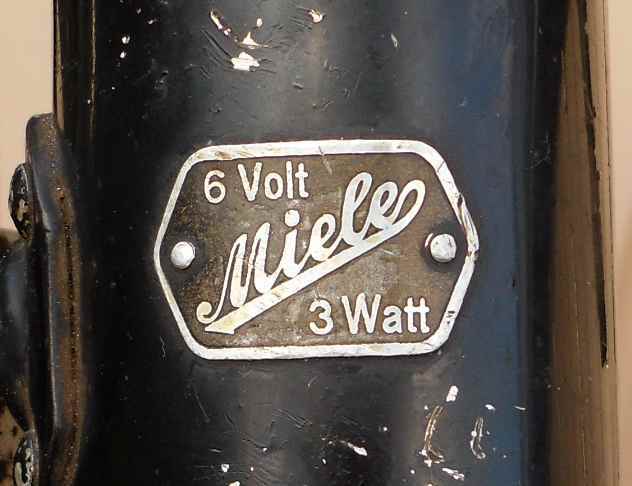 Same maker as the saddle: Not Miele, but Lohmann in Bielefeld. Imagine my joy when I unpacked the parcel from a remote place in (once more) Eastern Germany. 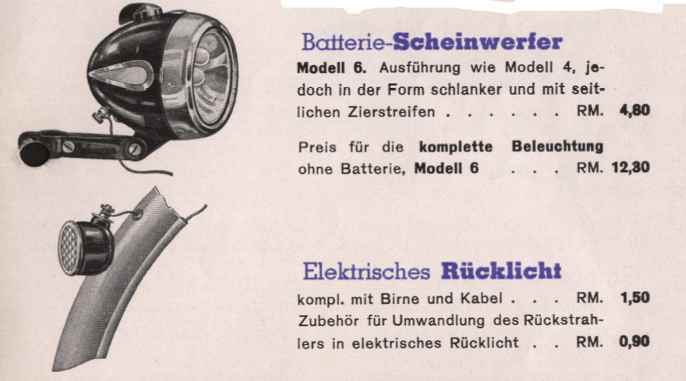 I actually bought the headlight sight unseen as only the dynamo had been pictured in the small ad. 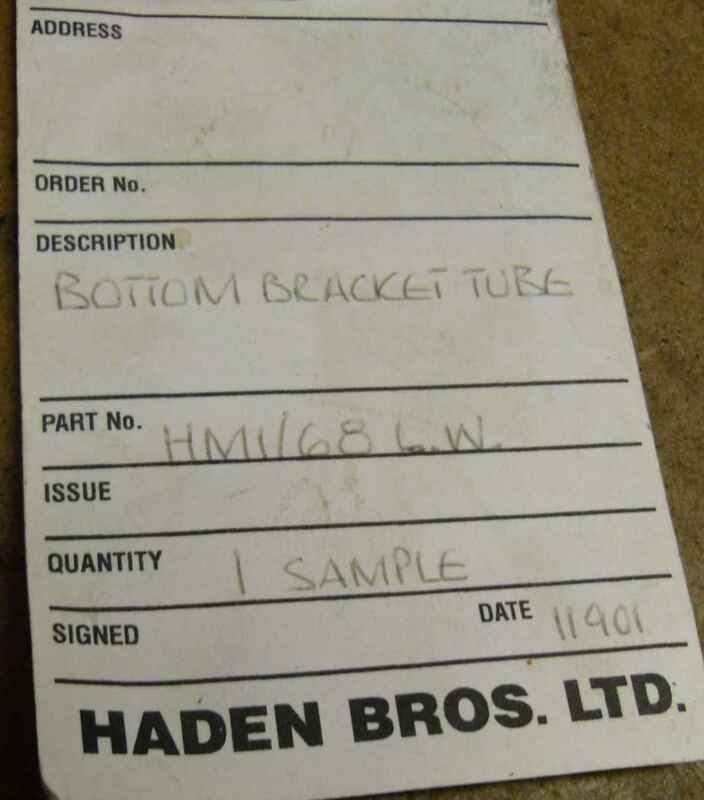 The headbadge that came off the donor frame. 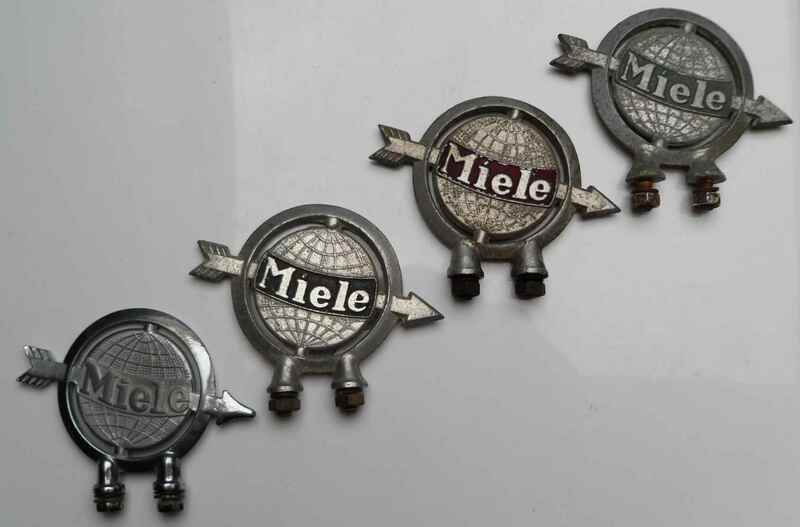 It´s a 1932 Melior badge, the first year this line was sold. 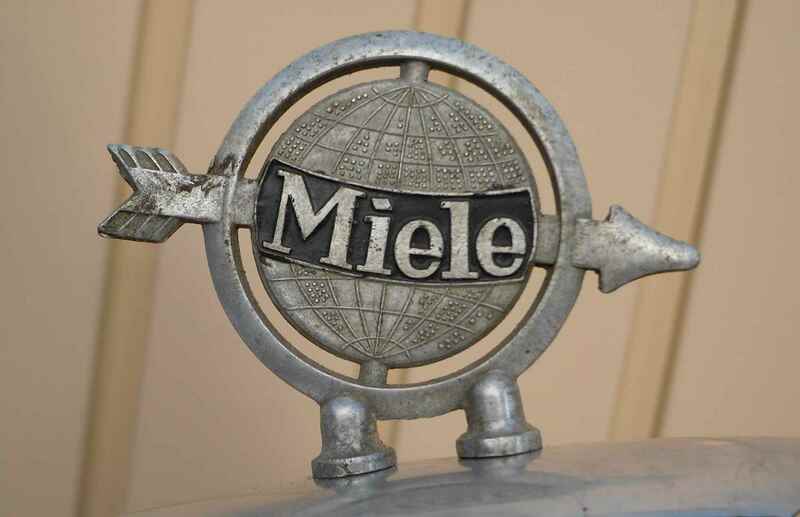 Look great, it´s a Miele, that´s all that counts for the time being. 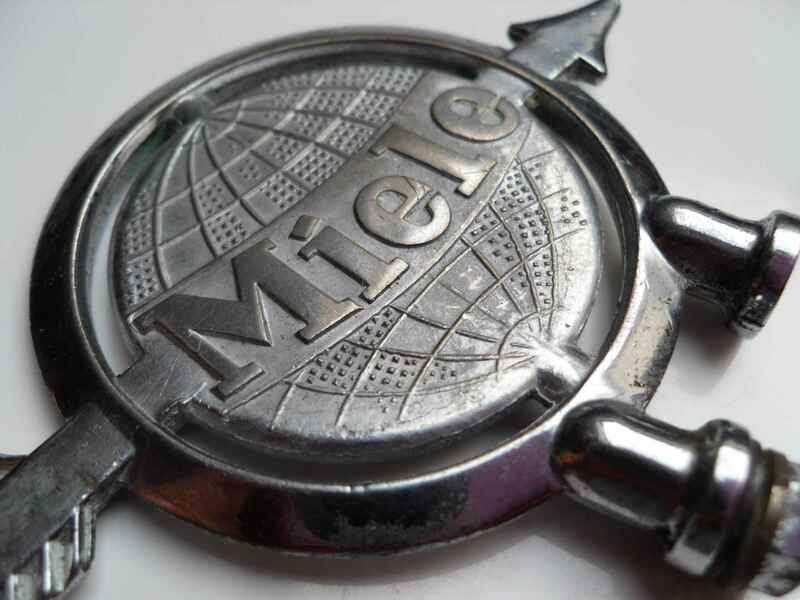 Miele Original post-WWII mudguard stays look nice, but they tend to break where the tube has been flattened. 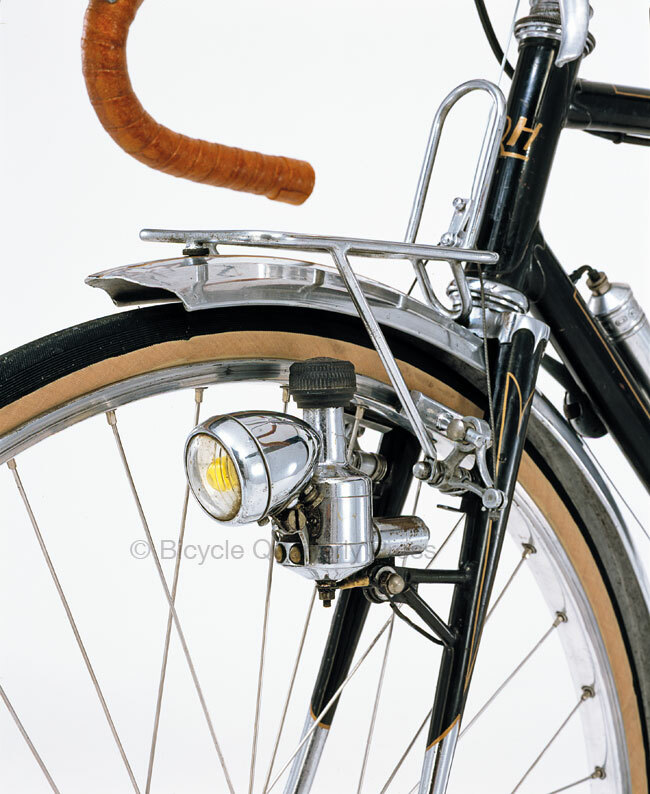 Early thirties stays looked slightly different – but again, as with the headbadge – is waiting for hen´s teeth an option? Here´s what made me look twice when I first noted the small ad on the net: The straight bridges between “top” and down tubes. Post-WWII, even late thirties means they are curved. The hand painted script is coming off again. 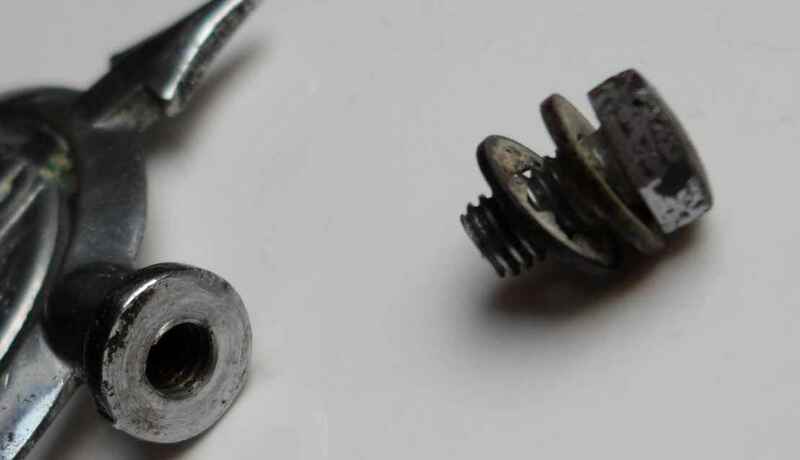 It might be 40 years old, judging from the bits I took off the bike which gave away the time when the first restauration might have taken place. The fork crown – not very finely cut. The first restorer didn´t do too bad a paintjob, and colourful shaded embellishments (geflammter Strahlenkopf) had been all the rage in the early thirties. 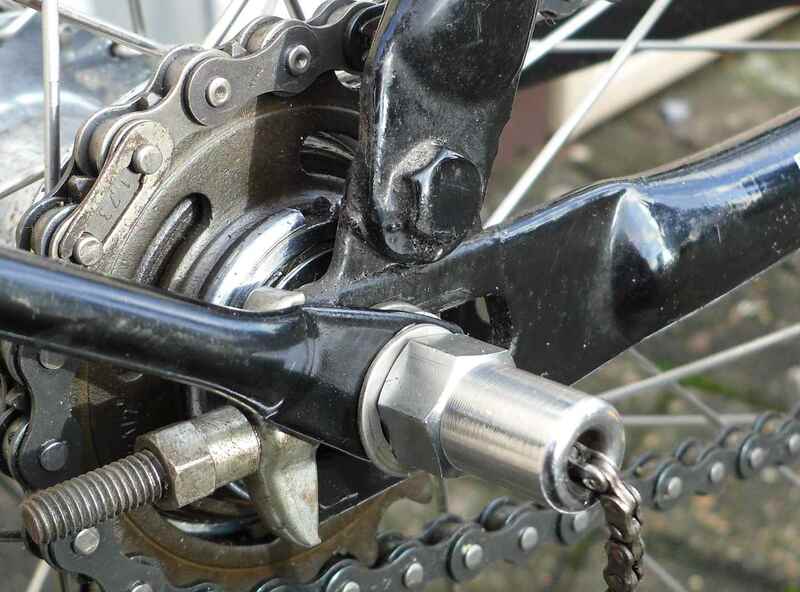 The typical Miele bolted dropout end/seat stay connection. 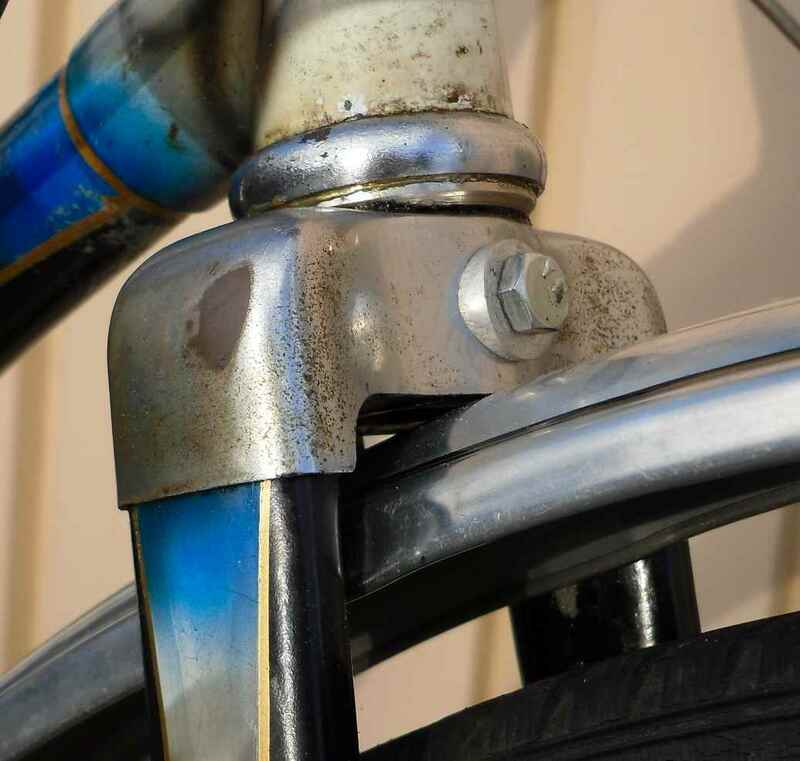 Typically German: The bridge between the two seat stays. So, more or less done with a project that I nearly hadn´t started. Of course, a number of things need to be put right, but I can do that when/if spares turn up. A tool pouch – that would be a great thing. 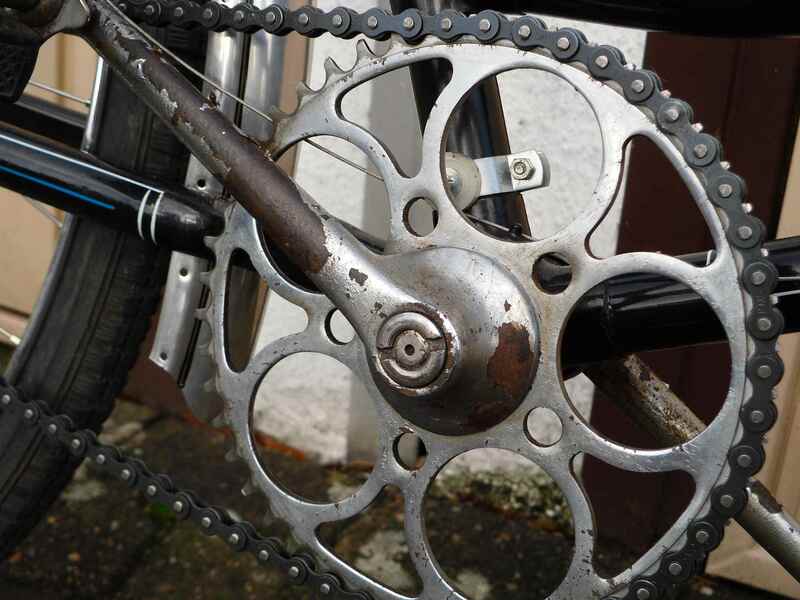 A big “thank you” to Heinz and Frank at Velo Classic for parts, help and advice. The two illustrations from Miele catalogues are courtesy Miele & Cie. KG. There´s books, big books and huge books, just as much as there´s passions, big passions and huge passions. If one meets the other, something really special is about to captivate the reader. Jan Heine has been well known for publishing his controversial but well-founded views on cycling more or less since Aeolus Butterfly days. Gabe Konrad was among the first to discover the geologist who had brought a passion for cycling from Europe. With hindsight it was only logical that Jan would take over the stake when Gabe stopped On The Wheel, his second venture. 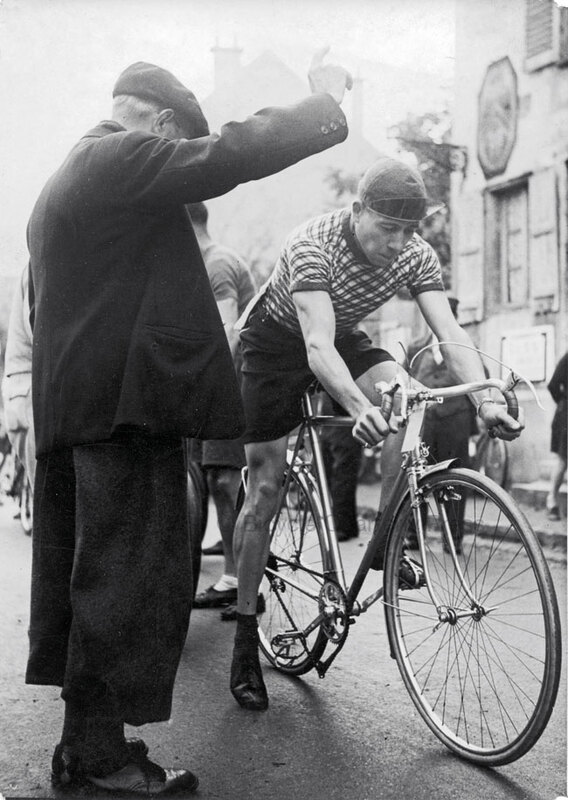 Already then Jan was writing about French cycling culture, with its rides, cycle makers and riders who in the thirties were to lay the foundations of a worldwide trend, and of what I think to be the most fascinating sport, randonneuring. 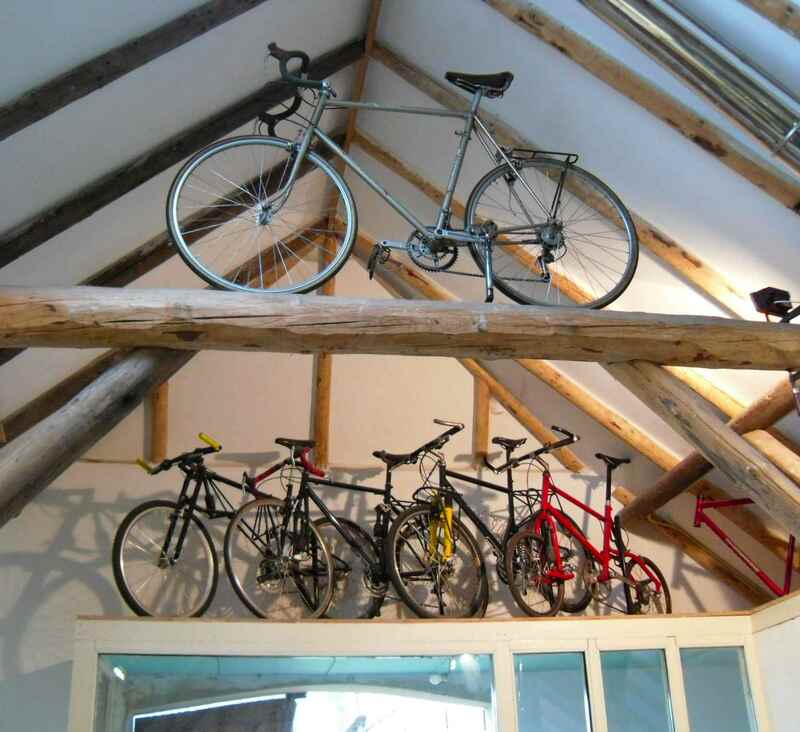 Jan wrote about this exclusively in the first issues of what was then Vintage Bicycle Quarterly, which evolved into one of the most interesting and, I guess, the only independent cycling mag in the world, Bicycle Quarterly. 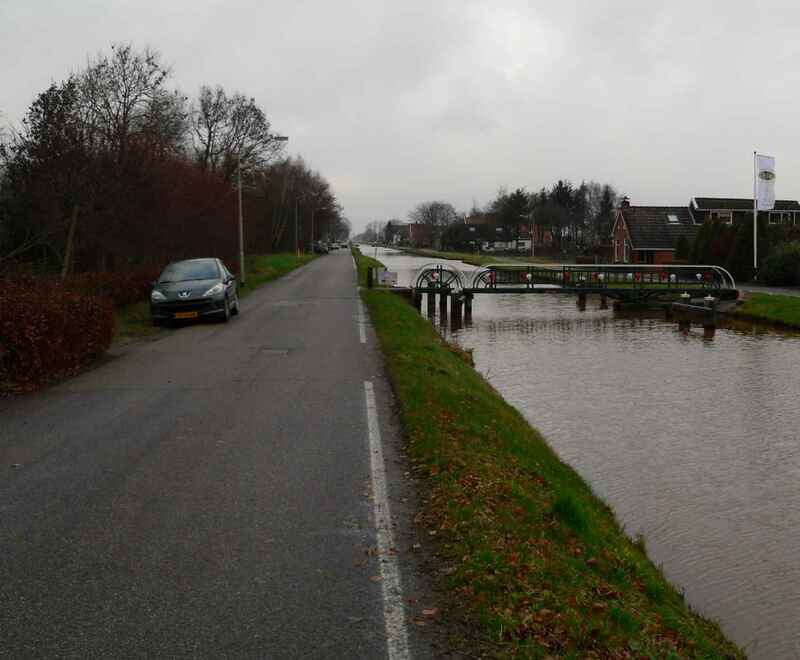 So Jan must be considered to be one of the world´s foremost experts on this matter, and developing a personal friendship with Lyli Herse, René´s daughter, of course helped hugely. 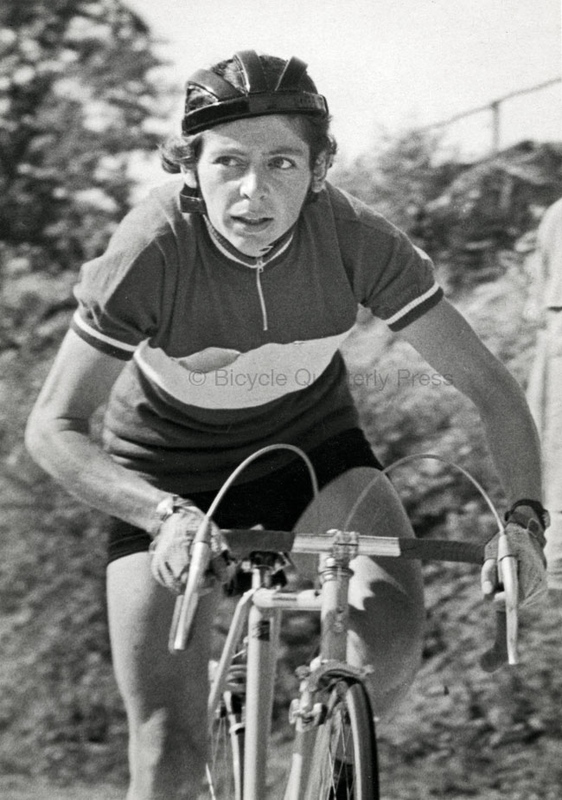 Lyli having been one of the strongest woman riders of her time (her racing and touring carreer stretched well into that of Beryl Burton´s), and having started working at her father´s shop full time aged 14, she has a lot to tell about all aspects of cycling. 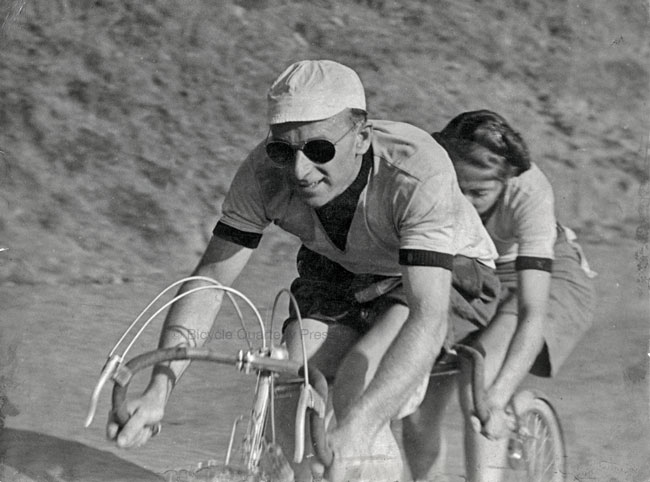 Here´s another picture of – well, not her, really, but of Robert Prestat and Lyli Herse – one of the most successful tandem couples of their time. 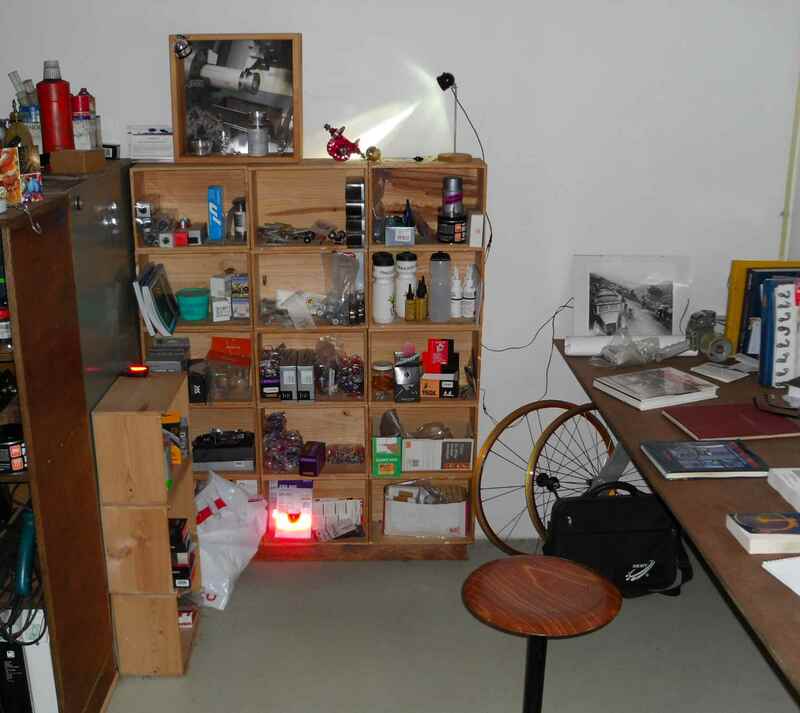 The story about Jan rediscovering the Herse family cycling photos in two suitcases in Lyli´s garage is already widely known. 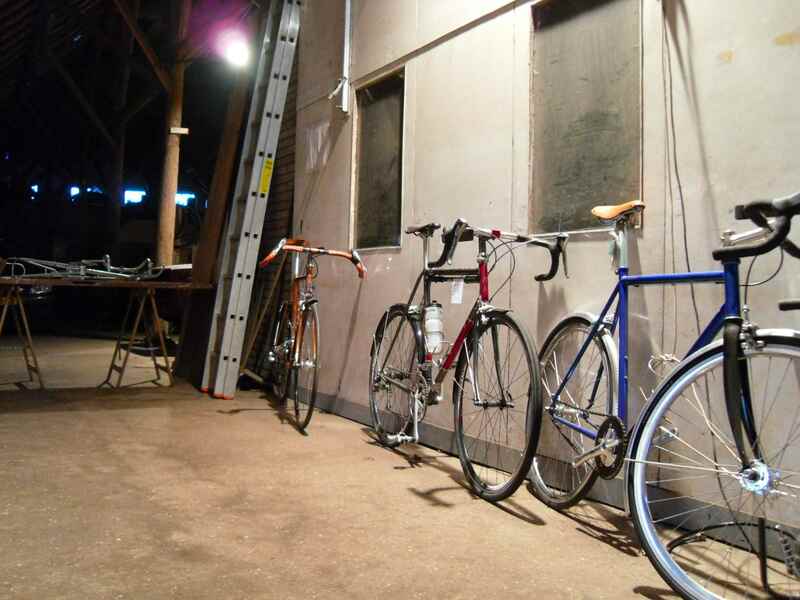 Many of these photos appear in his book, René Herse The bikes – the Builders – the Riders which has been on the market for more than a year already. I can´t really say why I didn´t get and review it earlier, but then – better late than never. But when I did get it at the beginning of this month, I really was amazed – so huge (nearly 3kg), so many photos, so much knowledgeable text, such a great layout. Jan has the space to go back to the very beginning of Herse´s history as a technician which lay at the Bréguet Aircraft Factory in the late twenties. So the first picture of the book after the introductory words by Jan and – you guessed it – Lyli Herse dates from 1930 and shows the two French transatlantic pilots Costes and Bellonte in a big American car being driven through a snowstorm of waste paper floating through NY skies after their safe landing. The first chapter is titled On the Forefront of Technology, and what better picture to illustrate this than that showing the two hero pilots who were first to cross the Atlantic the “wrong way” with prevailing winds opposing them. Little is known about Herse´s early days, but this start to the book explains more than blurred childhood pictures or still more blurred reminiscences ever could: Look here, there is a budding technician who at age 22 is good enough to work on the best plane in the world. 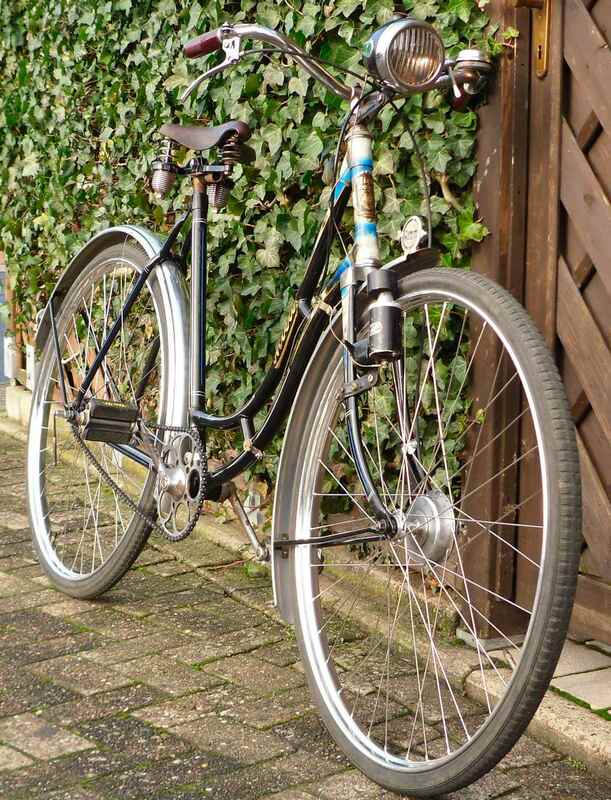 And this is what Herse tried to transfer to the world of bicycles: The utmost quality possible, the latest design features, extreme light weight yet strong structures – they were the work of the former airplane technician, reversing history inasmuch as pioneer planes from before the First World War often were built and flown by former cyclists. I have found another review on the net saying that more text would have been appreciated, but I ask myself where the info for that should have come from. The book is crammed with info about technical questions, about people, about French cycling culture, more often than not in side bar boxes giving info at the right time when it would have distracted from the plot of the running text. Plot – I know, a word used in describing fictional literature, but this definitively scientific book (using footnotes, giving a list of references in the end, and completed by an index) can be read like a novel – that´s how gripping it is. It has of course the added attraction of describing a beautiful girl´s life story – starting with childhood snaps of Lyli with her Herse bike, seemingly the first her father made, and ending depicting her as a middle aged woman who is obviously rather content with her life´s achievements, despite having married late. This is stuff that could even move hardened novel readers to tears. Coming to think of it, the book could as well have born Lyli´s name. And the pictures. The sheer volume of them makes taking in the book an adventure which can last for weeks. I´m close to fainting when I imagine how long it must have taken to scan and process all those hundreds of old paper prints. 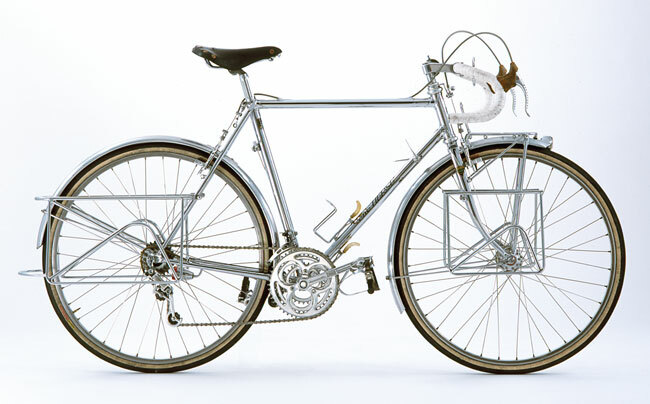 There is a combination of the Herse family´s cycling photos, studio photography of surviving bicycles and other sources like contemporary newspaper ads and the reprint of a complete Herse catalogue with Rebour drawings. As readers of this blog will know, photography is not my forte, so saying that I adore most of the photographies in Jan´s book is not an expert´s opinion, but then, who is. There are always pictures accompanying the text which are special, look at this Osgear geared bike, for instance. 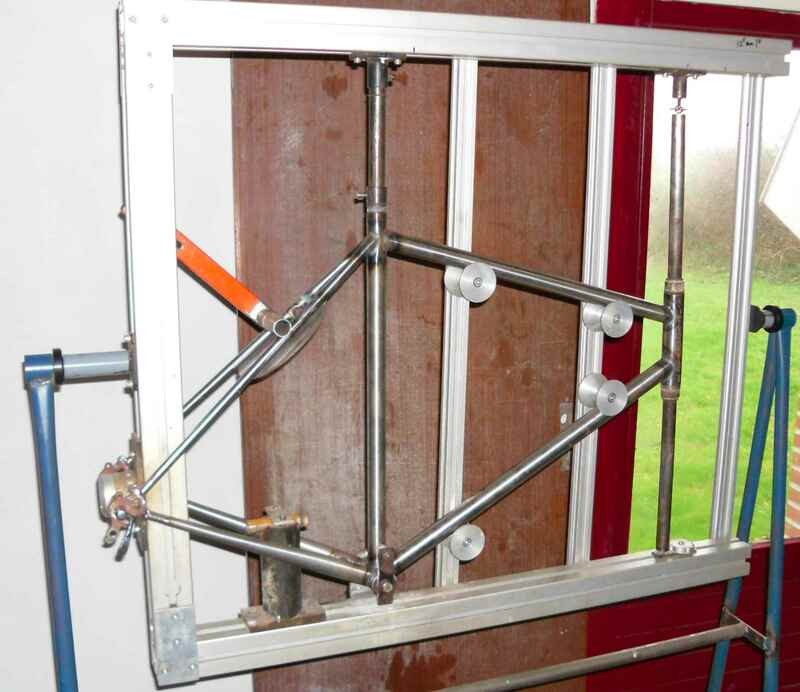 This I found especially fitting as <SNEAK PREVIEW> I´m in the process of building up a 1938 Dürkopp pro frame with just such a device. Heaven knows when I´ll finish it, though. 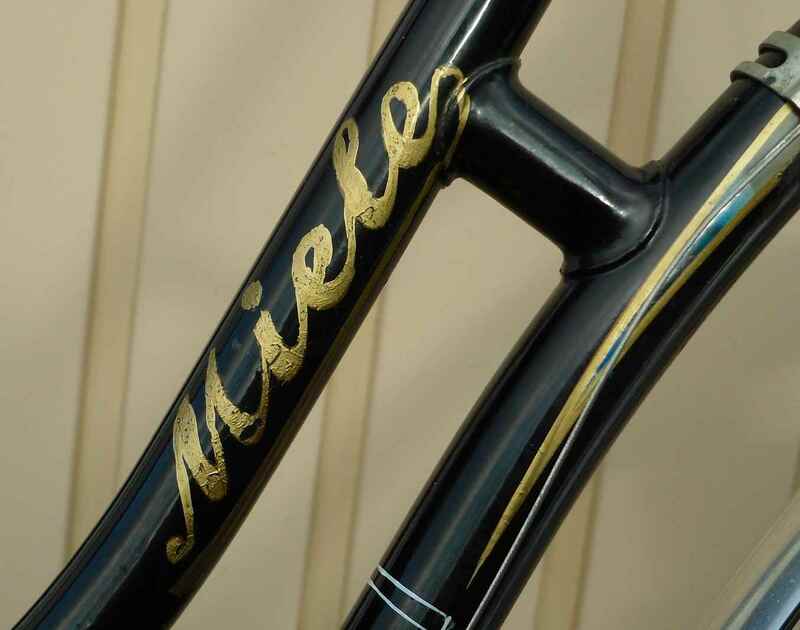 As the reader tucks into the book it becomes increasingly clear that Jan has succeeded in repeating Herse´s feats in bicyle building, who produced not only frames, but also components of the highest quality. 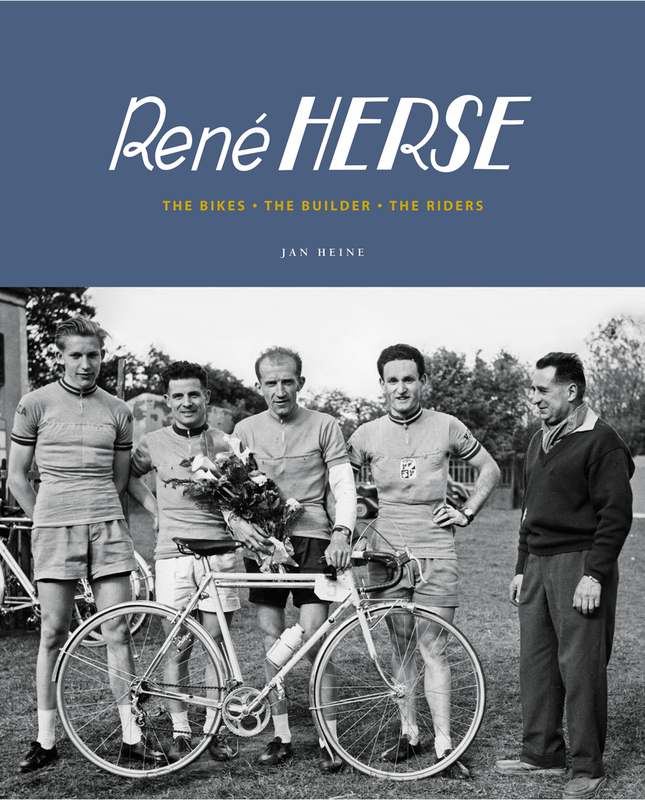 Jan´s achievement is in the field of writing books but looking at the result it becomes clear that René Herse sets standards not just as far as the frame of information is concerned, but also when considering the components like choice of photos and layout. His first two volumes were good, and have deservedly been translated into German, but the Herse tome tops them all. It may well herald a new golden age of bicycle book writing. All of Jan´s books and BQ can be ordered from bikequarterly.com. In Germany they are available at Maxime Verlag. 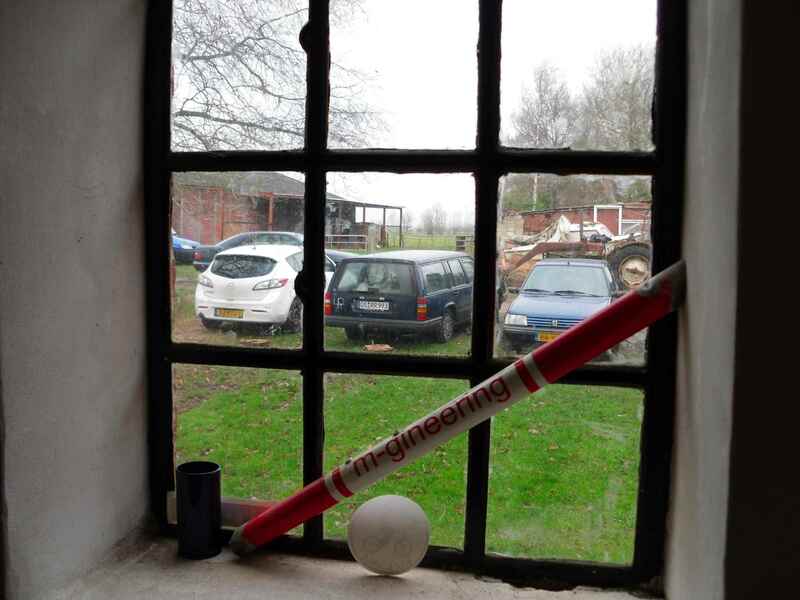 Jan´s first two books as well as BQ can also be bought at M-Gineering in the Netherlands. All photos in this review are courtesy of Jan Heine/Bicycle Quarterly Press. So we got in the car, in a place for which the word “provincial” is a compliment, but it´s where we live. We drove through the Northern German Plains, for about 200 km, until they become the Northern Dutch Plains, and then we saw that where we had arrived there are still more open spaces (if that is possible), but the dogs are much cuter, too, as a consolation. Actually, so are the cats. 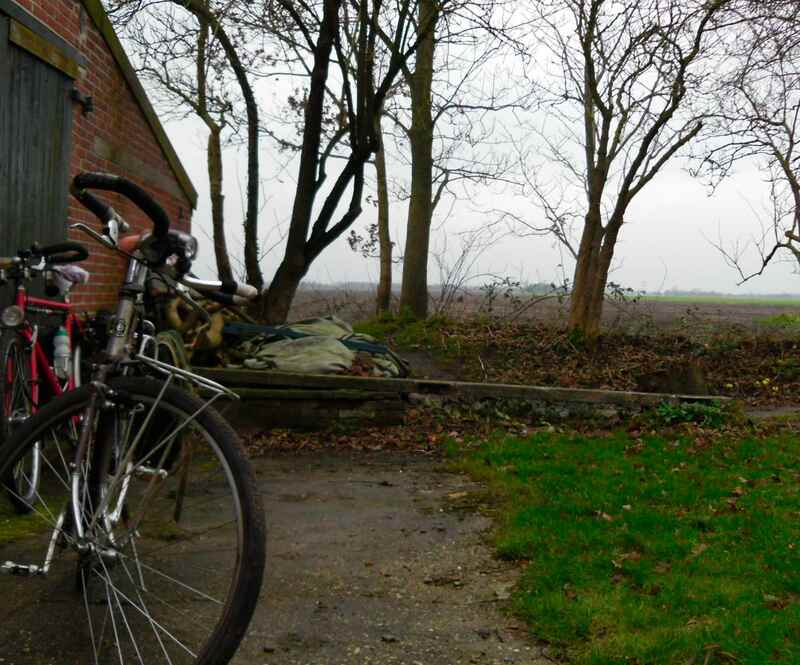 And, of course, the bicycles, and that´s what we´d come to Kiel-Windeweer for, after all. 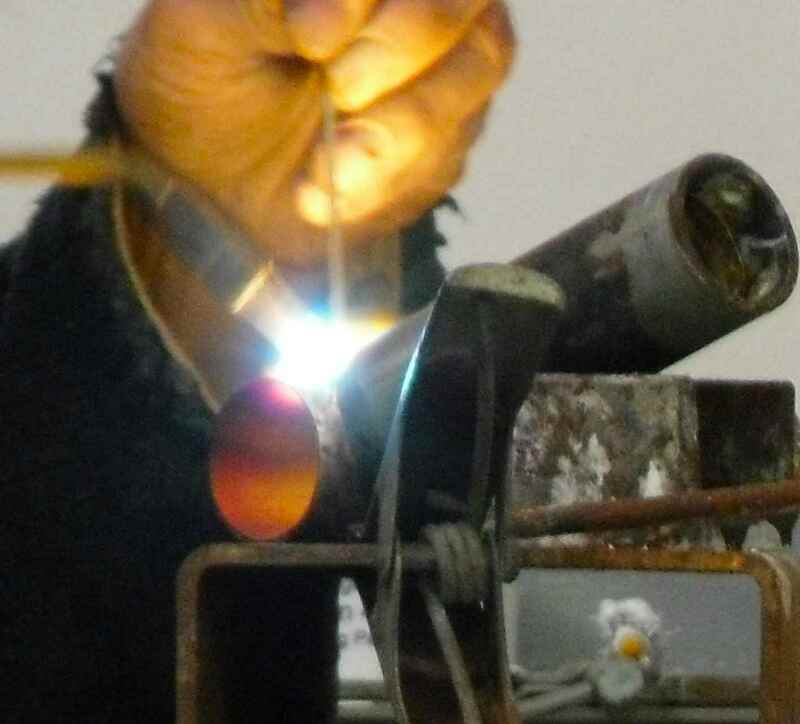 Last Sunday Marten Gerritsen, owner of M-Gineering, maker of fine steel bicycle frames, and importer of SON lighting products for the Netherlands, treated everybody who happened to be in his shop to vegetable soup, appletart and other goodies, and to a brazing demo. 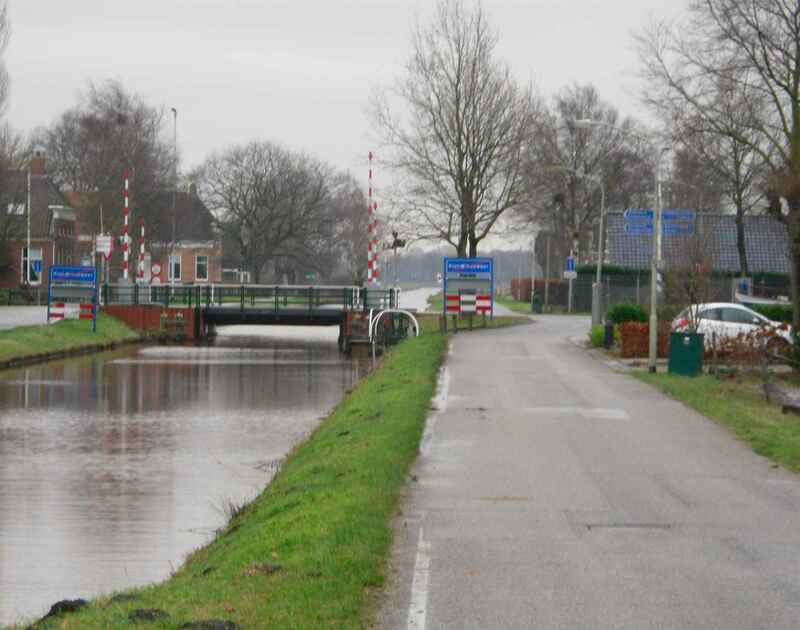 does lead to Marten´s place, but it´s quite a way along the long and straight canal. Suddenly we were there, though, and turned into a yard. You know that you´re right when you look into Marten´s shop window. Marten´s whole place is pure understatement, at least from the outside. 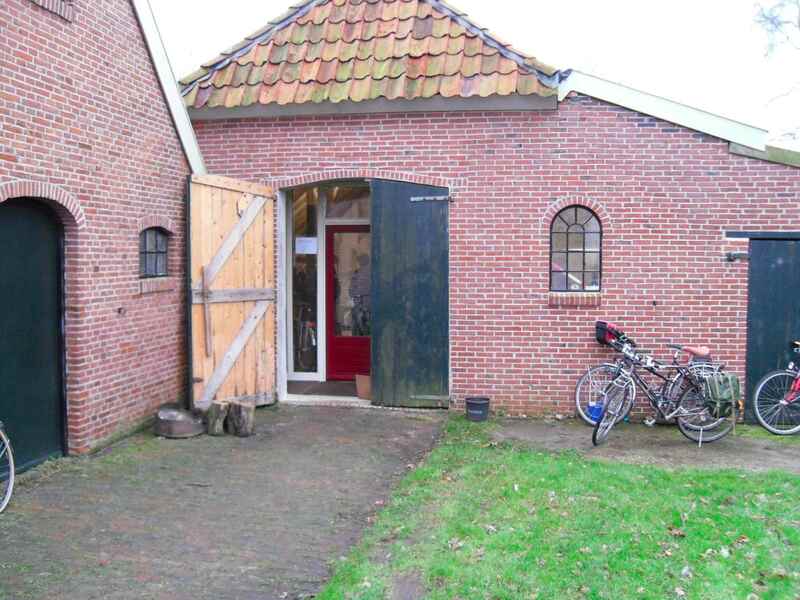 It´s not discernable that the simple farmhouse Marten lives and works in houses the knowledge and the machinery to make some of Europe´s finest bicycles. This is where you can find the workshop. 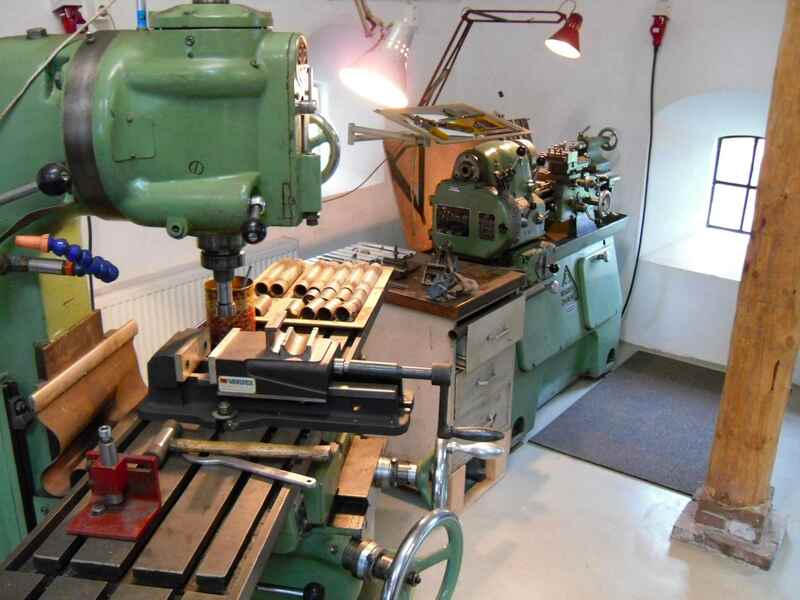 Here we have a milling machine and a lathe, indespensable for any serious sort of metalwork. 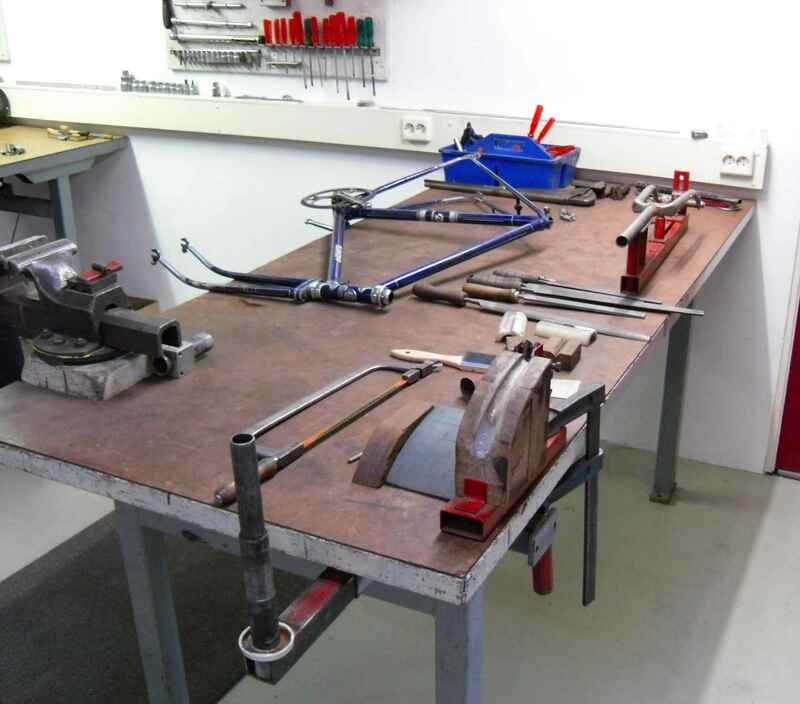 On this bench there is a vise and (front) a wooden device for bending fork blades. 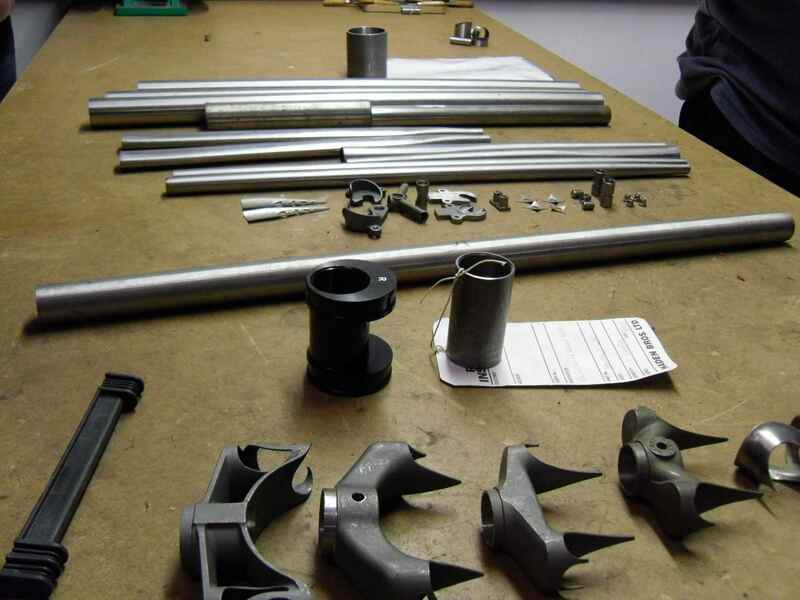 Marten built this aligning device himself, preferring to have the seat tube as the base which is at right angles with the aligning device and from which all the other tubes and angles emanate. 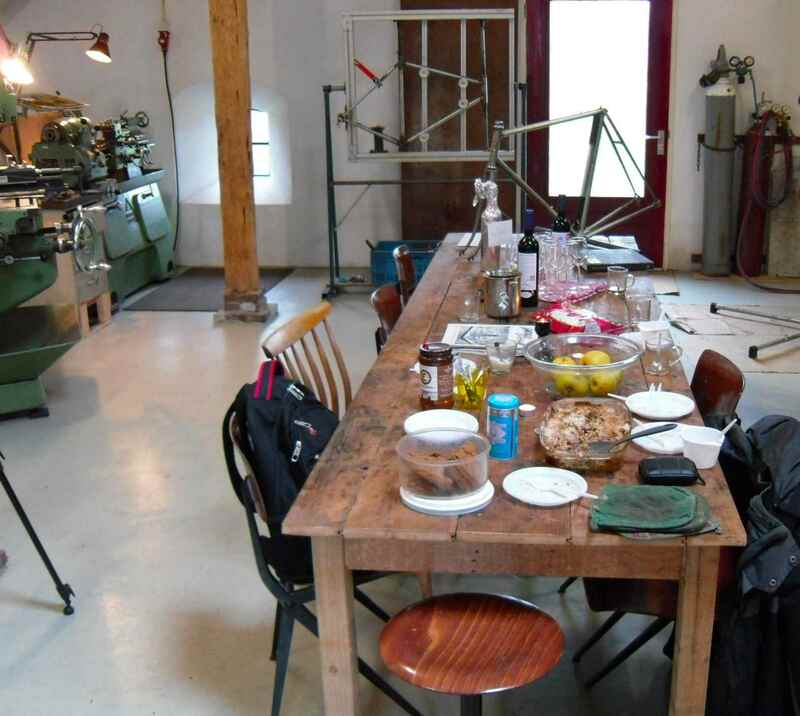 So after the tour of the shop we were treated to hot food, and soon about 40 visitors peopled the premises, all talking bikes, mostly Marten´s customers. 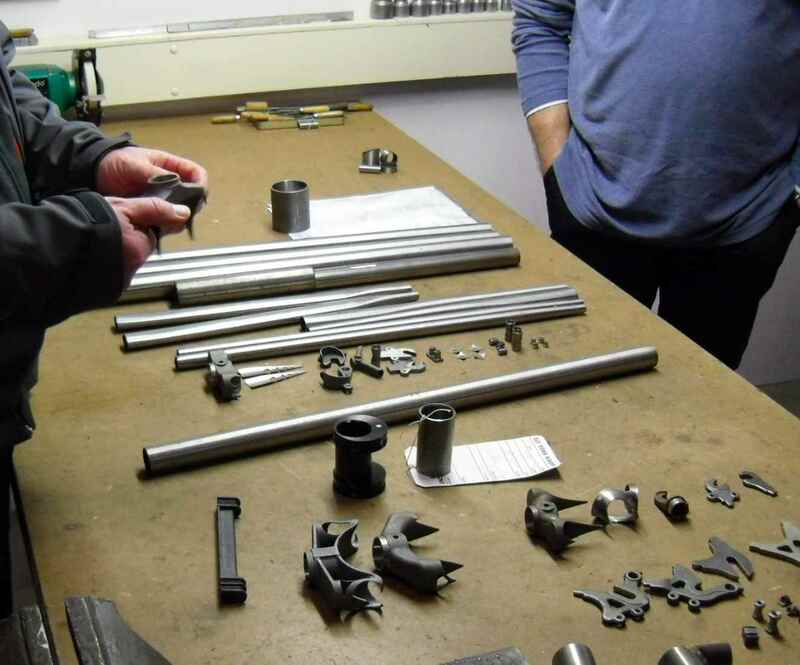 They were shown the machinery and the parts necessary to produce steel bicycle frames while munching apple crumble, so I guess Marten´s workshop will have crumbs in all sorts of strange places. 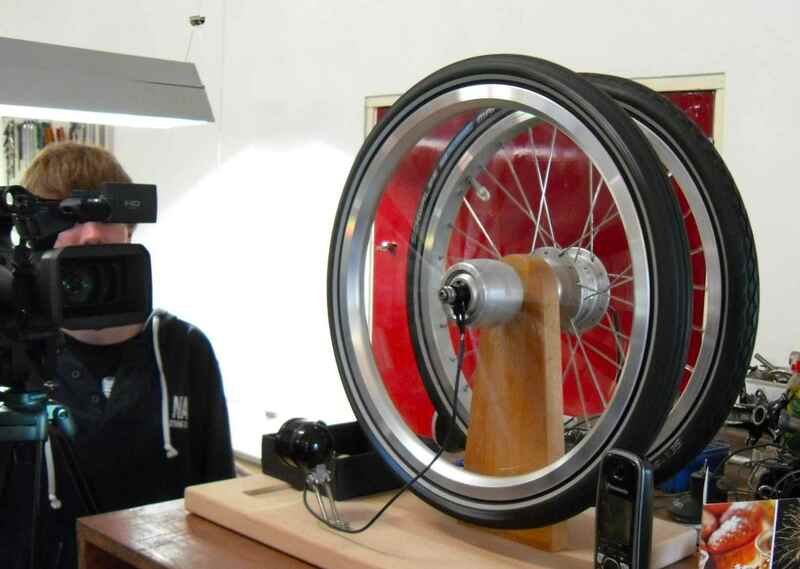 and a display pairing a SON, latest model, with a Shimano, cheapest model, which shows that the SON wheel keeps turning with the headlight switched on long after the Shimano wheel has stopped – with the headlight switched off. This is much more impressive when shown in moving pictures, of course, and as soon as the film is ready and published on youtube, I´ll mention it in a post. 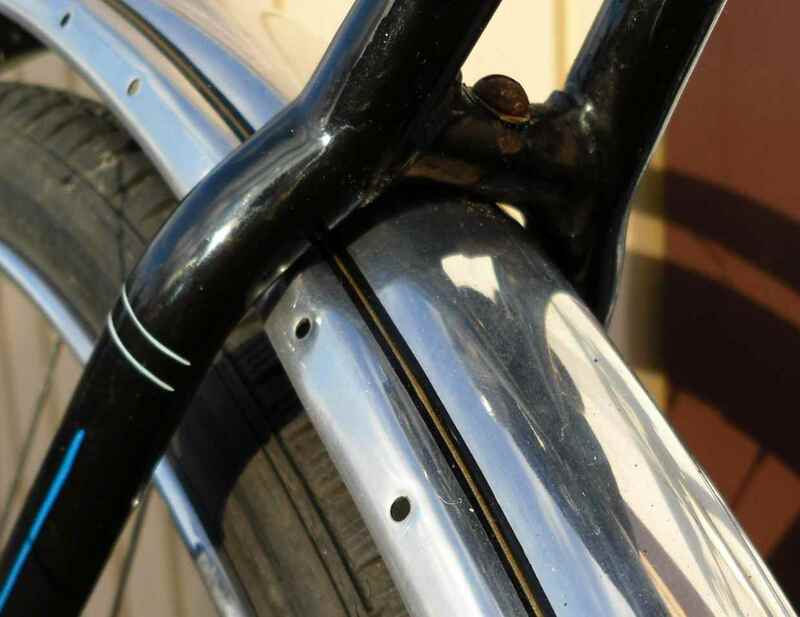 Also Marten´s collection of interesting examples from the history of the bicycle is growing, so of course a Johnny Berry frame, late model, has to be there, too, what with Berry being called the “framebuilders´ framebuilder”. Some visitors also had brought some of their nice bikes, adding to Marten´s herd, so a rather interesting exposition was assembled. 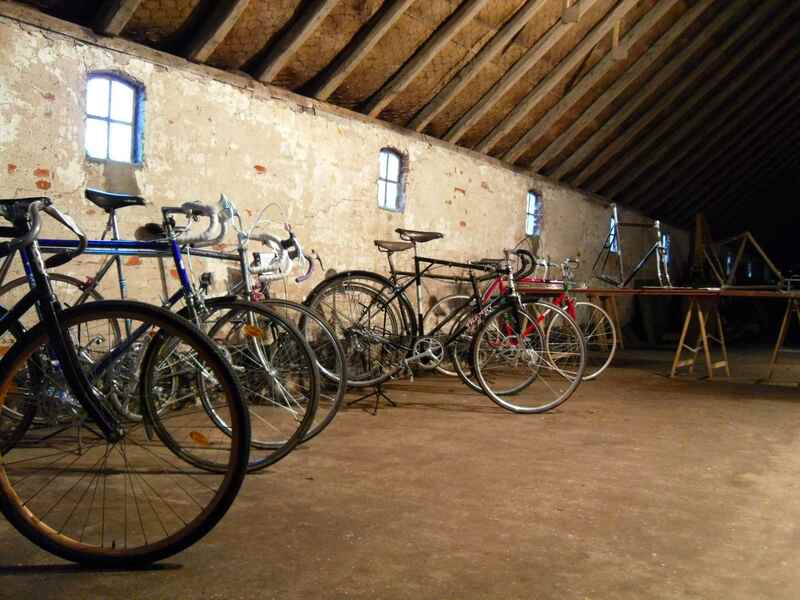 It included, among others, a High-E wheelset, a Barra alloy Mixte frame, a Marschall Randonneur, a ca. 1905 Columbia in an amazing condition, a late thirties Carpenter and a 1950 Thanet Silverlight. 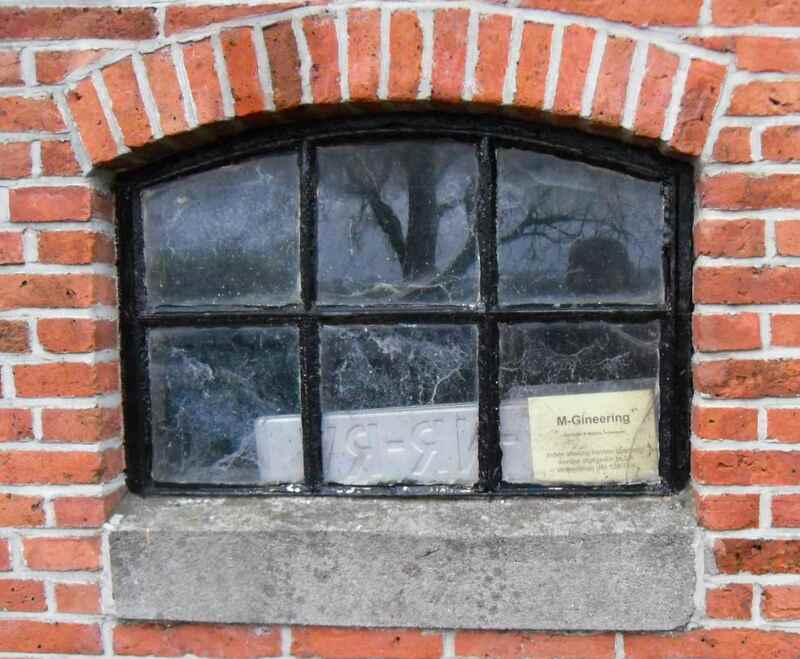 On the other side of the barn, leaning to a structure which housed Marten´s workshop until last year, there was a display of his own machines, among them the M-Gineering frame that Marten took to Doug Fattic´s to practise painting on. The paintwork bowls you over. 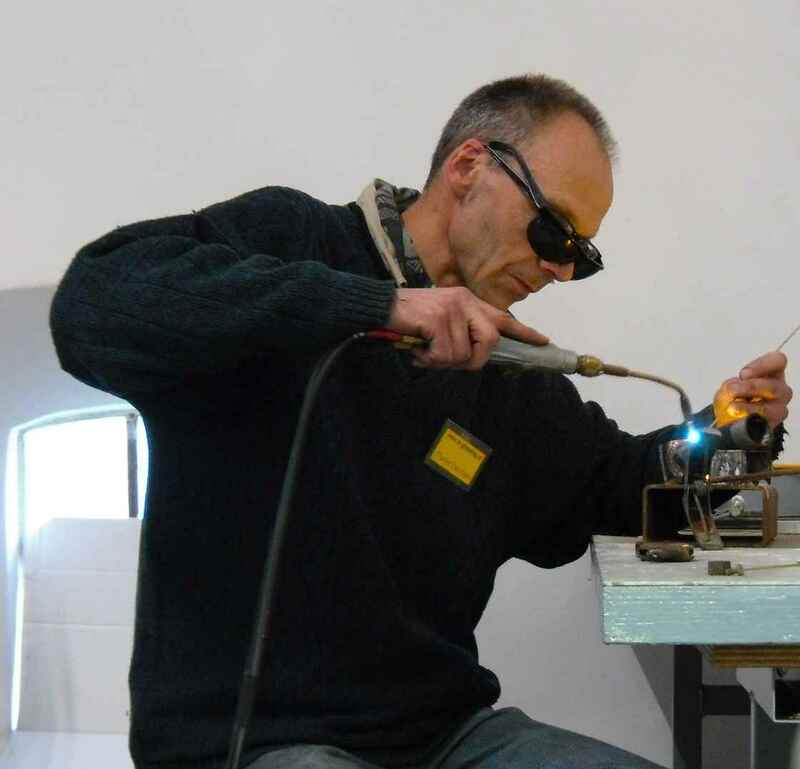 Next, Marten gave the brazing demonstration which everybody had been looking forward to. 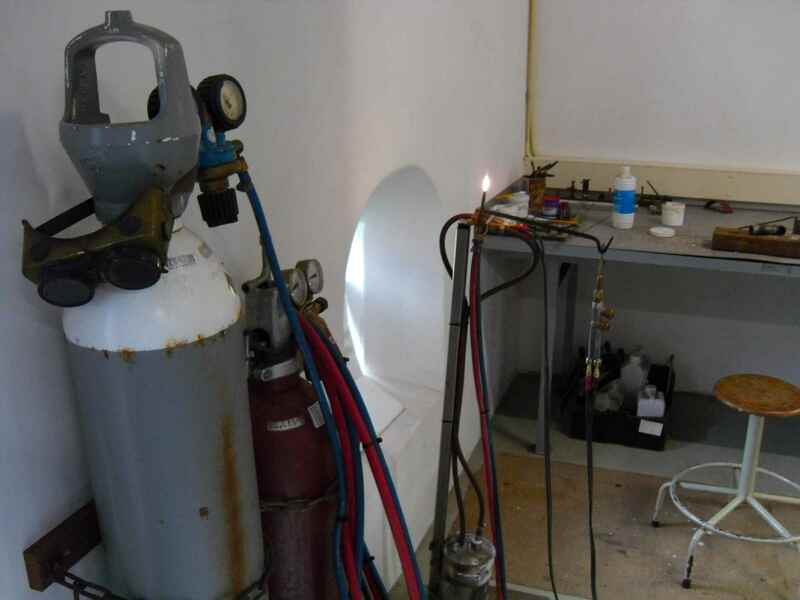 Two short lengths of tube were brazed together in the shape of a “T”. My son made this video. Soon the very enjoyable afternoon came to an end, people got on their bikes and in their cars, and we all hope that there will be a similar event next winter. The combination of Marten´s apple crumble and his bikes would again prove irresistable, I´m sure.